The head of Spain, Spanish Prime Minister Mariano Rajoy, who sent in troops against Catalonia has been one of the most corrupt politicians in modern time. At last, he has been overthrown by Parliament after an unprecedented corruption scandal in Madrid. Now we are introducing political uncertainty in Spain, Italy, and Greece will soon follow. 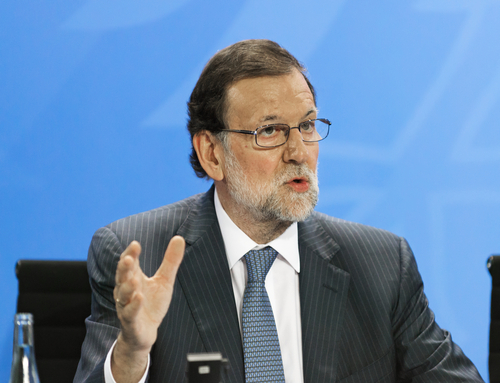 In Spain, a broad party alliance emerged based on the vote of no confidence of the Social Democratic PSOE against Rajoy of the conservative People’s Party (PP). The motion was supported by 180 MPs, requiring at least 176 votes. This is PSOE boss Pedro Sanchez who is the new head of government. He is expected to be commissioned by the king to form a new government quickly. Those who have supported the no-confidence vote included the leftist party Podemos and two separatist parties from Catalonia. Rajoy simply gave up for his support vanished before the vote. Corruption is fine until it is exposed. Rajoy came to office back in December 2011 and led a conservative minority government since 2016. The PSOE head came out and proclaimed: “Today we are opening a new chapter in the history of democracy in our country.” He is a former economics professor. The corruption scandal has involved 29 defendants, including former PP leadership cadres, who were sentenced to 351 years in prison for corruption, embezzlement, money laundering and illegal enrichment. Corruption among politicians is just off the charts. Obama’s longtime fundraiser Antoin “Tony” Rezko was convicted on federal fraud and money laundering charges, and anyone else would have been brought up on conspiracy if they were no Obama. On the same day, the Obamas closed on their house, Rezko’s wife, Rita Rezko, bought a vacant lot next door from the same seller, at the full asking price of $625,000 so Obama got a deal on the house. Later, Rezko sold the lot to Obama for $300.000. Obama said he paid fair market value for the property decline. By more than 50%. Of course, the press and the police look the other way when anyone else would call it outright corruption. Welcome to the real world where corruption is just off the charts everywhere!